*This section defines how the Late Timesheets are viewed and all the different types of actions that can be taken against them. 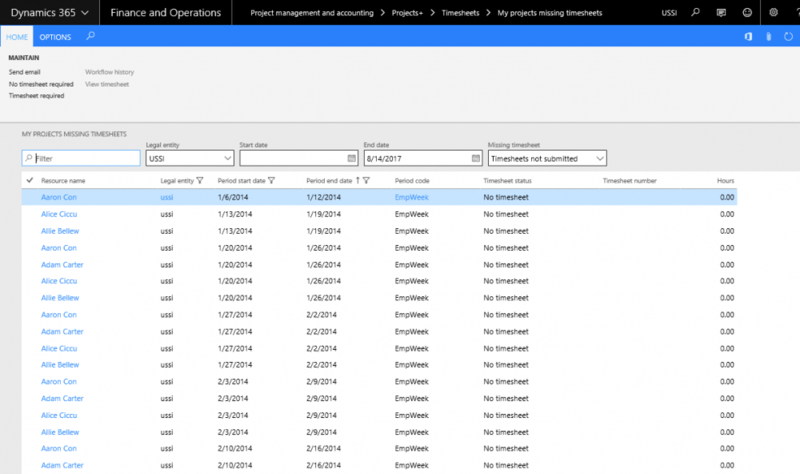 Based on the logged in user’s role multiple windows are available to view the timesheets. This list page displays all timesheets of each and every employees, for all timesheet periods. This new list page gives the user the following options/functionalities. 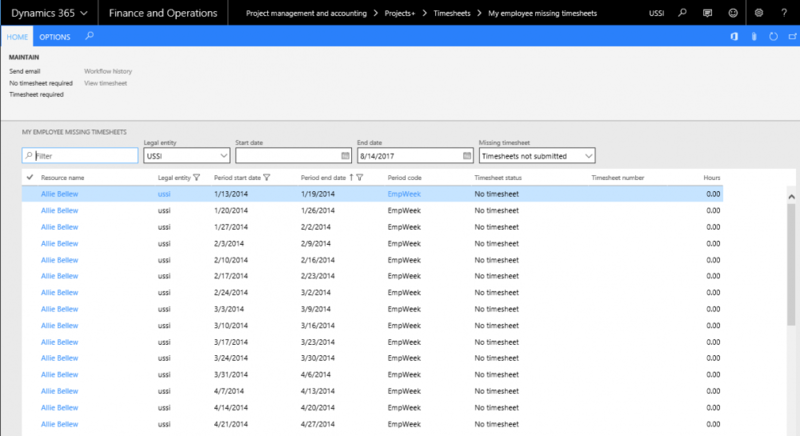 Send email to employees who have pending updates to timesheets. Mark certain employees who do not have to submit timesheets. View the workflow history for timesheets. View all timesheets of all employees for all timesheet periods, or based on the filters selected. View all timesheets of any others legal entity employees for all the timesheet period. Sort the employee timesheets by period end date and resource name on All missing timesheet form. 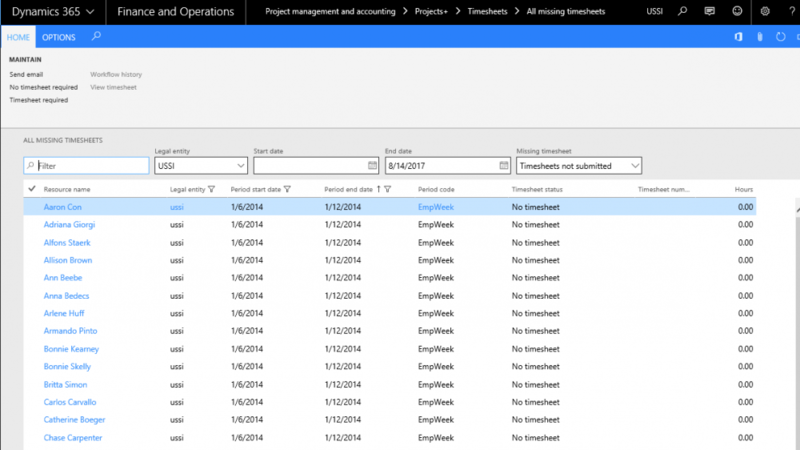 Project management and accounting > Projects + >Timesheets > All missing timesheets. Resource name Name of the resource to whom the timesheet belongs. Legal entity Legal entity of the resource. 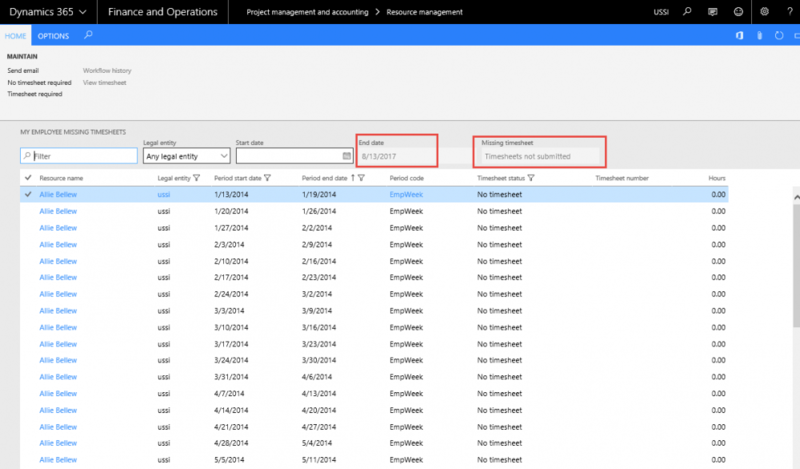 Period start date Timesheet period start date of the resource. Period end date Timesheet period end date of the resource. Period code Timesheet period code. Timesheet status New filters added to filter timesheets with different statuses are as below in Late timesheets list page. 1. Timesheets not submitted - No Timesheet or draft status. 2. Timesheets in review - Submitted/ In Review timesheets to be displayed. 3. Not posted - Timesheets approved not posted- Late timesheet not posted due to system hang up or connection lost. 4. Posted - Posted or no timesheet required will be displayed in this filter option. 5. In progress - Timesheets not in status Posted and not in status No timesheet required. Timesheet number Timesheet number of the timesheet will be displayed. Hour The hours entered in the timesheets will be displayed in this field. Quick filter Control New filter added on the All missing timesheet form to filter the timesheet records by resource name and followed by all the field in this form. Legal entity Added new filter legal entity to control legal entity lookup to filter the intercompany resource timesheet records. Filters – Start date The user can enter a date from when they would like to see the information on the list page. By default, this start date will be blank, thus all records will be seen. Filters – End date Current date will be defaulted onto this field, so that the list of timesheets displayed in the list page does not go beyond the current date. However, the user can enter any end date he requires. In effect, the records displayed in the list page will be that from the start to end date specified in the filters above. The list page contains the following buttons. Send email The user can select multiple records and choose to send emails to the users as reminders to fill in their timesheet. Note that users can select records where the timesheet status is “No timesheet.”. On record selection and clicking on send email button, a new form opens, in which additional message can be typed by the user, which shall be displayed at the bottom of the email. Timesheet required. The user can select multiple records with the status No timesheet required and click this button, the status will change to No timesheet. Workflow history The user can choose a timesheet which is in the status other than Created, No timesheet or No timesheet required, to view the workflow history of the selected record. View Timesheet The user is able to view the timesheet on clicking this button. 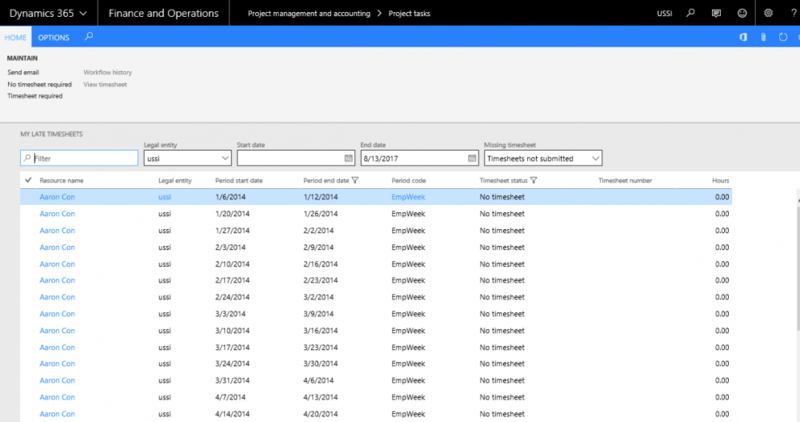 For sending the late timesheets email reminders, a template can be configured. Below are wildcards\string fields that can be used in the email template. These wildcards will be replaced by the actual values during the run-time for each document emailed. %name% Replaces the resource name of the selected timesheets on email. %telephone% Telephone number of the resource on the timesheet. %hours% Replaces the Total timesheet hours on the email. %periodcode% Period code associated with the resource on the timesheet. %timesheetnumber% Timesheet number of the selected timesheet. %status% Timesheet status of the selected timesheet at the time of sending email. %periodFrom% Timesheet period start date of the selected timesheet. %periodTo% Timesheet period end date of the selected timesheets. %manager% Manager associated with the resource on the timesheet. This list page displays the list of All missing timesheets and displays the records of employee’s timesheets for whom the logged in user is the timesheet approver. Below form screenshot shows where the timesheet approver is set on the Worker form. Project management and accounting > Common Forms > Projects+ >Timesheets > My employee missing timesheets. 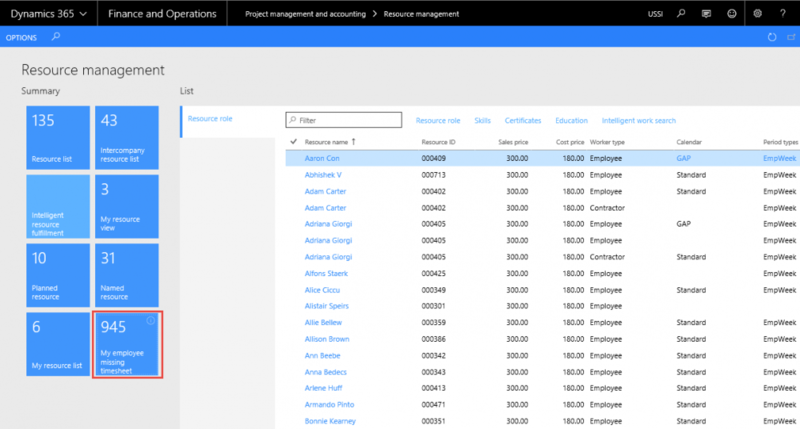 This list page displays all the missing timesheets but displays the records of employee timesheets for the project for which the logged in user is the Project manager. The rest of the functionality and capability of this list page is similar to the All Missing Timesheets. This list page is available in the below path. Project management and accounting > Common > Projects+ >Timesheets > My projects missing timesheets. 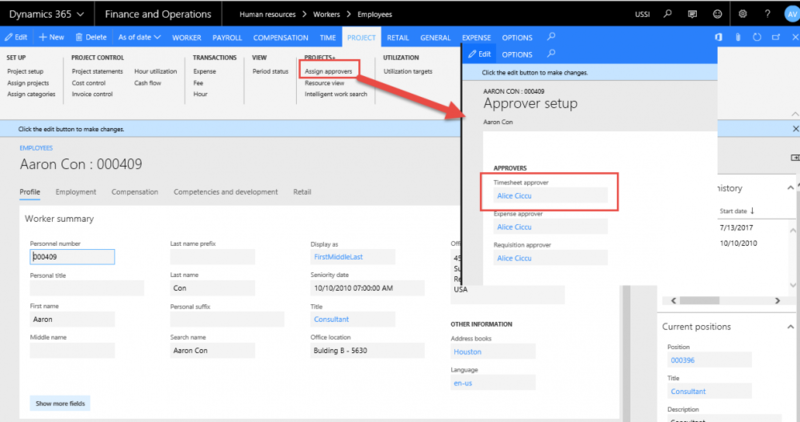 Note: There is a dependency of this feature on the Project manager setup. Unless this setup exists on the projects, there would be no data in this list page. Following Workspaces have been modified to include the timesheet details. Based on the logged in user’s security role data will be populated on these workspaces. All missing timesheets forms have been linked to the project tasks workspace to get access on my timesheet missing in all the legal entity. My Late timesheets tiles shows logged in user’s Missing timesheets records for all the periods in the system. 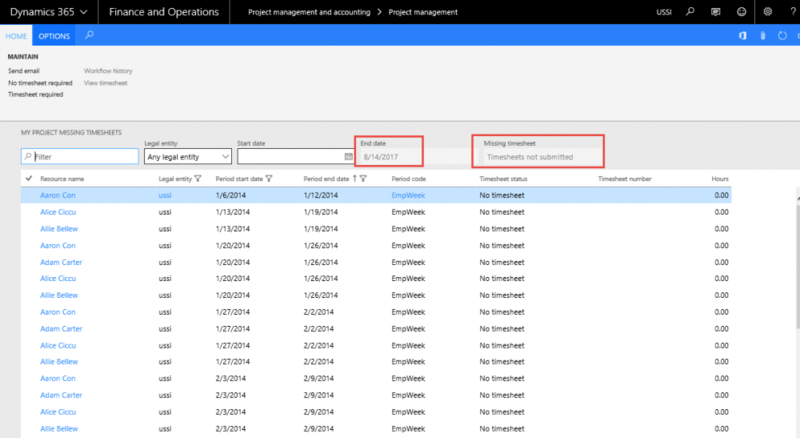 To view more details on the missing timesheets, user can click on the My Late Timesheets tiles and below form opens. 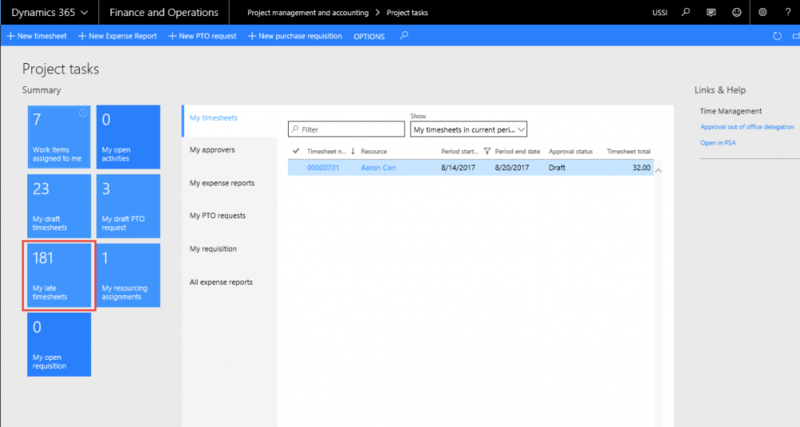 All missing timesheets forms have been linked to the project management workspace to get access on My project missing timesheets. 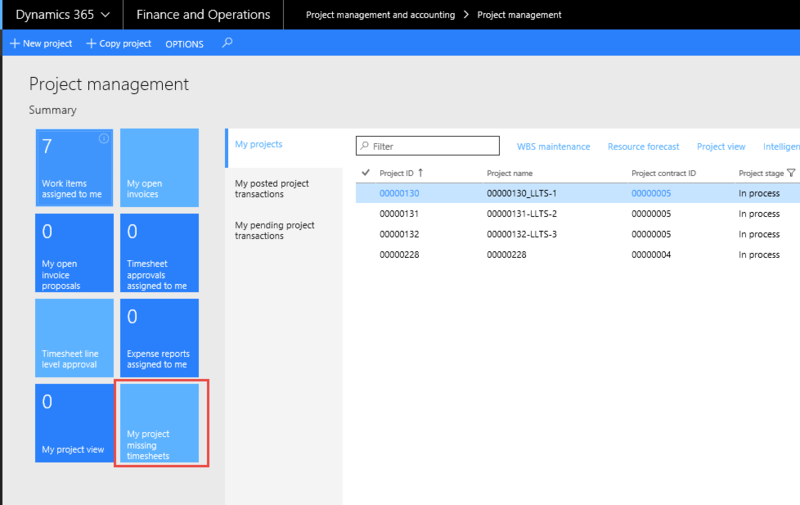 My Project missing timesheets tiles will display the timesheets for all the resources in the projects where logged in user is set as Project Manager. To view more details on the timesheets click on the My Project Missing Timesheet tile and below form open with the details. All missing timesheets forms have been linked to the resource management workspace to get access on all employee missing timesheets. My Employee missing timesheet tiles displays the list of All missing timesheets and displays the records of employee’s timesheets for whom the logged in user is the timesheet approver. To view more details on the timesheets click on the My Employee Missing Timesheet tile and below form open with the details. Note: Filters ‘End Date’ and ‘Missing Timesheet’ status filter are disabled, and resource manager can view the resource missing timesheet with status “Timesheets not submitted” on this form.